MSFB, one of the largest food banks in the nation, is a charitable organization based out of Memphis that is a member of Feeding America – a national network of food banks. MSFB serves a 31-county region with a total population of over 2 million people. Over 1/5 of the people in this service area are deemed food insecure, meaning they don’t have enough food for an active, healthy life. Of this food insecure population, 29% are children. Currently, MSFB serves ~230,000 individuals annually. After the expansion, MSFB will attempt to serve all of the 400,000 food insecure individuals. MSFB will create 100 new construction jobs (of which 60% are expected to be filled by residents of the LMI community), and 6 new FTEs. The warehouse is located in a census tract with a poverty rate of 29.6% and a median household income that is 64.6% of the Area Median Income. The demographics of this vulnerable population include 13% of residents over the age of 65 and a diverse population in which 55% identify as white, 40% as African American and 4% as Hispanic. 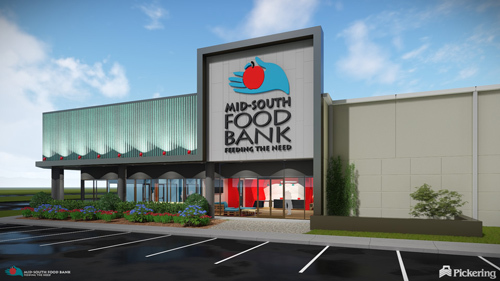 National Community Investment Fund provided $5 million in New Markets Tax Credit (NMTC) allocation and a $929,750 loan to finance the expansion of Mid-South Food Bank (MSFB). MSFB will be consolidating two obsolete warehouses lacking sufficient cold storage and loading docks, with a modern, larger facility designed to accommodate their needs and expand operations from 15 million to 25 million pounds of food distributed annually. This includes dramatic expansions in fresh produce and other healthy food options and will include a choice pantry for local residents to have access to food directly at the facility (located in a USDA Food Desert). Southern Bancorp is a Community Development Financial Institution headquartered in Arkadelphia, Arkansas that was founded in 1986. Southern Bancorp’s mission is to create economic opportunity in rural and underserved communities by providing responsible and responsive financial products and services that balance profits with purpose. Today, Southern Bancorp is a $1.2 billion asset organization with over 80,000 customers and 43 branches located primarily in underserved markets in the Mid-South.